One day Dharmanath told his mother that he is not born to live the life of luxury and comfort, to be a king and rule over people but he has taken birth to get independence from the vicious circle of life and death. He also told her that he was King Dridhrath of Bhaddilpur town in Mahavideh area. Although he had lot of wealth and large kingdom but lead the life of detachment from worldly things. 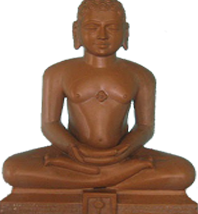 He had a bend for spiritual practices and in the process earned Tirthankar-nam-and-gotra. He reincarnated as God in the Vijyant dimension. Now he should go and achieve the goal for which he has taken birth on the Earth. He went roaming place to place and meditating. Lots of problems came in his path but they all had to surrender to Dharamnath ji’s feet. After two years of spiritual practices he reached Ratanpur and while sitting under Dadhiparan Tree he attained omniscience. His first religious discourse was attended by the fifth Vasudev Purush Simha and Sudarshan Baldev. In his first discourse he mainly dealt with the subject of form and ill effects of passions. A large audience was benefited by this eloquent discourse. At last he went to Sammed Shikharji and there while meditating there all his Ghati Karma shed away and he attained Nirvan.